VANCOUVER - Perfection in hockey is often determined by less than a second, less than an inch, less than a breath. That was the difference between the Swiss team and the U.S. team yesterday in Team USA's 2-0 quarterfinal victory. It was the difference, too, between Jonas Hiller, the outstanding goalie of the Anaheim Ducks, nearly stealing this game from the nation he pays most of his taxes to, and just being the reason the tired and torturous team from Switzerland had a chance in it, right down to its harrowing end. Hiller stopped 41 shots, about a dozen spectacularly. The two that went by him - one was disallowed - did so only after some topspin that Roger Federer would be proud of. "Without him," said former Flyer Luca Sbisa, a Swiss defenseman, "we wouldn't have been this far in the tournament." This far was the quarterfinals of this roulette wheel of national pride. Already, the Swiss had battled the U.S. in a 3-1 opening-game loss, and pushed the Canadian team to a shootout before Sidney Crosby rescued their back bacon. The Swiss then beat Norway in overtime and Tuesday night squeezed past Belarus with a shootout goal of their own. So they should have been gassed, incapable of matching the U.S. in physicality or speed. "We would have needed a miracle today," Swiss coach Ralph Krueger said. Yeah, yeah, yesterday was the 30th anniversary of the U.S. team completing its miracle against Finland, but many of the Swiss players weren't alive for it. Certainly not Hiller, their 28-year-old anchor. 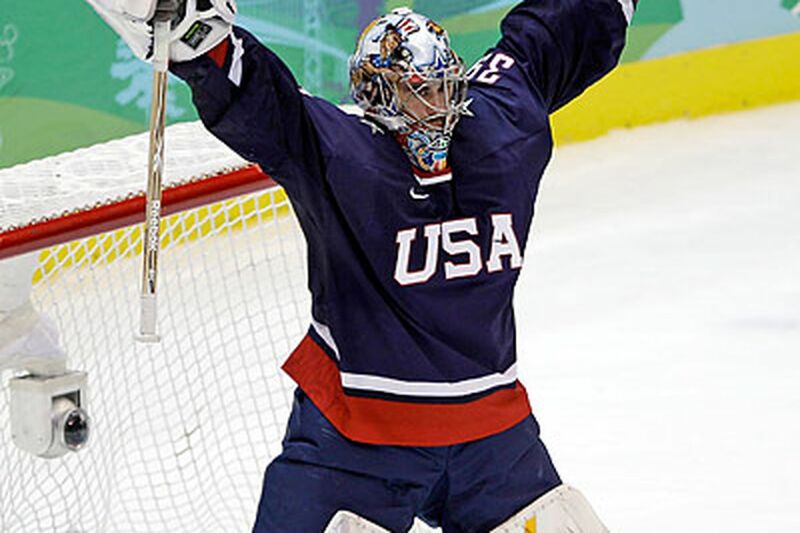 "He just keeps improving," said U.S. goalie Ryan Miller. "I'm just happy him building his resume didn't come at my expense." And at the expense of the U.S. team advancing to tomorrow's semifinals against Finland, a 2-0 winner over the Czech Republic. Miller stopped 40 shots in the 5-3 victory over Canada Sunday. Yesterday posed an alternative challenge. Stay involved, stay sharp, even as minutes went by without a single challenge. The shots were 18-4 after one period, 32-8 after two, 44-19 when the game ended. "You know a mistake isn't an option because Jonas is on fire," he said. "I just had that feeling he wasn't going to make a mistake. It was going to take a nice bounce or a nice shot to beat him." Actually, it took a few. Zach Parise, who scored both U.S. goals, including an empty-netter with 12 seconds left, also hit the post with a second-period shot. Ryan Kesler hit a crossbar and later appeared to give the U.S. a 1-0 lead as the second period expired. Hiller had stopped 31 straight U.S. shots when Kesler, the Vancouver Canucks star, fired a high, wide-angle shot across the crease in the second period's final few seconds. Hiller deflected it upward, tried to swat it in midair, and instead slapped it behind him. It rolled ever so slowly over his shoulder and then across the crease. The clock hit zero just before it did, however. Team USA's celebration quickly turned to a slow trudge toward the locker room. So this is what it feels like when the other guys' goalie becomes a combination of luck and brick. "We just kept preaching to each other on the bench not to get frustrated," Parise said. "Keep playing the way we're playing and hopefully something will find its way in." "I think it was a unifying moment for us," Team USA's Bobby Ryan said. "We knew Jonas was capable of stealing a game. We just had to keep putting pucks on him and we'd get an ugly one." They did, and it mirrored the one that got away. A flurry of activity in the Swiss zone produced a power play. The U.S. had mustered just one shot in three second-period power plays, something they will have to improve if they are going to shock the world again. "That kind of hero mentality," groused U.S. coach Ron Wilson afterward. "Stickhandling through a minefield instead of making a little play. All you're doing is stepping on a land mine and blowing yourself and a few others up around you." The winning goal came from a couple of little plays. Brian Rafalski, the 36-year-old defenseman who has starred in the Americans' 4-0 run thus far, flipped a soft shot from inside the blue line into the slot. Parise tipped it upward, and once again the puck topspun beyond Hiller's glove, this time finding the inside of the post. The 35th shot, it came with just under 18 minutes left to play. The Swiss had more shots from that point (11) than they had all game. But Miller, Sbisa said, "was like a brick wall." Well, not exactly. Moments after that goal, Swiss forward Sandy Jeannin made a wide move around two U.S defensemen and fired an impossible angle shot that deflected off Miller's stick shaft. The puck hit the far post hard, rebounded back out, and the U.S. went the other way. After another disallowed U.S. goal, officials reviewed the play to see if the puck had crossed the goal line, if Krueger had in fact the makings of a perfect miracle. He missed by less than an inch.